This has become a huge "go-to" winter favorite with my family the past several years and I realized, as seems to be the case with many of my recipes, I haven't shared it with you! And that's a shame, because it is fast and easy (despite a long list of directions) and sooooo good. My kids are HUGE Kalamata olive fans and they're always begging me to put olives in everything. These olives might not be the most budget-friendly ingredient (try to find them pitted, at an "olive bar", for the best price) but a few go a long ways, packing a lot of flavor, so I usually have a deli container of them in my fridge. 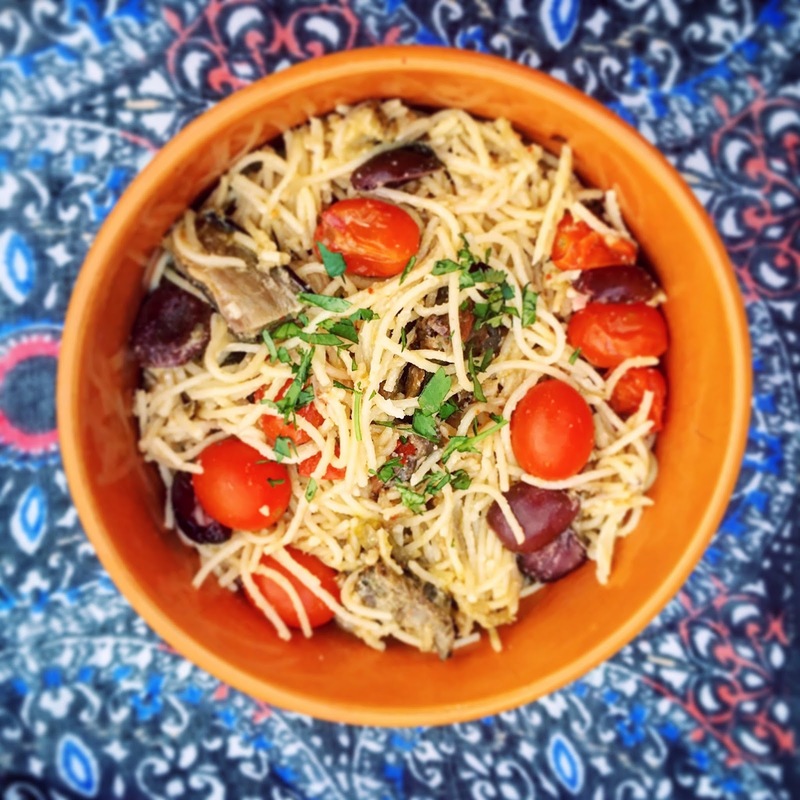 They're a perfect fit with this dish; salty olives, combined with the earthy, roasted eggplant and sweet tomatoes make a very flavorful combo! Plus, we all know that olives have loads of antioxidants and anti-inflammatory properties, right? I use whole wheat angel hair pasta here because when I first switched to using whole-grain pasta, my kids just weren't sold on its texture. Angel-hair seemed to be the most accepted variety, it cooked up tender and the texture was similar to "regular" pasta. Everyone likes whole wheat pasta in any shape or size now, but I still use angel-hair in this dish because that's how I did the original recipe. It can get mushy quickly, but will hold it's shape nicely if not overcooked. Use whatever pasta you prefer, but if you're new to whole wheat pasta, or just not a fan, I highly recommend trying angel-hair! I especially miss my fresh, garden tomatoes in the middle of the winter, and roasting a few, tiny, sweet, store-bought "grape" tomatoes just until their skins burst intensifies their flavor and almost makes up for a lack of home-grown, summer tomato goodness. -Quarter eggplant lengthwise into wedges, and coat lightly with olive oil (eggplants will absorb olive oil quickly, so I have the best luck coating them with my hands for a quick, even, but not saturated layer of olive oil). -Put eggplant on baking sheet, skin side down, sprinkle with salt and roast in the middle of the oven, turning once or twice, until very soft when pierced with fork, about 15 - 20 min depending on size of eggplant. -Remove eggplant, stab all over with fork, and place, cut side down, on a layer of paper towels to drain and cool for 5- 10 min. while chopping olives and parsley. -Chop olives (I'm a little OCD and prefer individually quartering each olive because I much prefer uniform olive pieces and not tiny black bits in my pasta, but it IS time-consuming - do what works for you!!) and chop parsley. -In large skillet, heat a Tablespoon of olive oil. -Add tomatoes and stir gently over high heat for about three minutes, until starting to warm through. -Add crushed garlic and eggplant to skillet. -Lower heat to medium, continue to stir gently, occasionally, JUST until tomato skins begin to wrinkle and one or two have burst. Gently stir in olives. -In a large pot, boil water and cook pasta according to package directions. -When pasta is al dente, remove 1 cup of the cooking water, set aside, and then drain pasta. 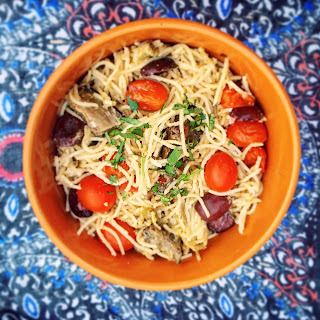 -Put drained pasta in the skillet with eggplant and tomatoes, over medium heat. -Stir/toss together gently - tongs work best here. -Toss to mix, add more cooking water if needed, (you want the pasta moist but not "soupy"), season with salt (if needed) and a generous amount of fresh-ground black pepper. **NOTE: If the tomatoes have not "burst" (and not all of them will) upon serving, stab those little suckers with a fork right before eating them, the juice inside is VERY HOT! !